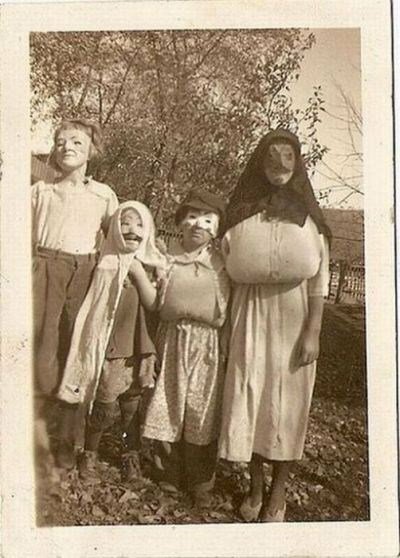 I always love finding photos from Halloweens past. Did you make costumes from things you had at home? Did you sew them from a pattern? Or did you buy them from a store? What was the weirdest costume you ever wore? This is great! Reminds me of a story from my family. My parents claim my grandparents came over cross-dressed (my grandmother a man and my grandfather a woman), but my parents had no idea who they were. (I find this a little hard to believe, but maybe the costumes were THAT awesome.) Anyhow, they creeped my mom out, but she let them in and gave them coffee. (?!?) Then, my parents’ dog gave away who they were! Haha! That’s a great story! Thank you so much for sharing.